Day 5 of the trek roused itself as from the fog of slumber. The sun rose muffled by cloud all over the peaks, and the balconies of the inn were damp with the night’s moisture. 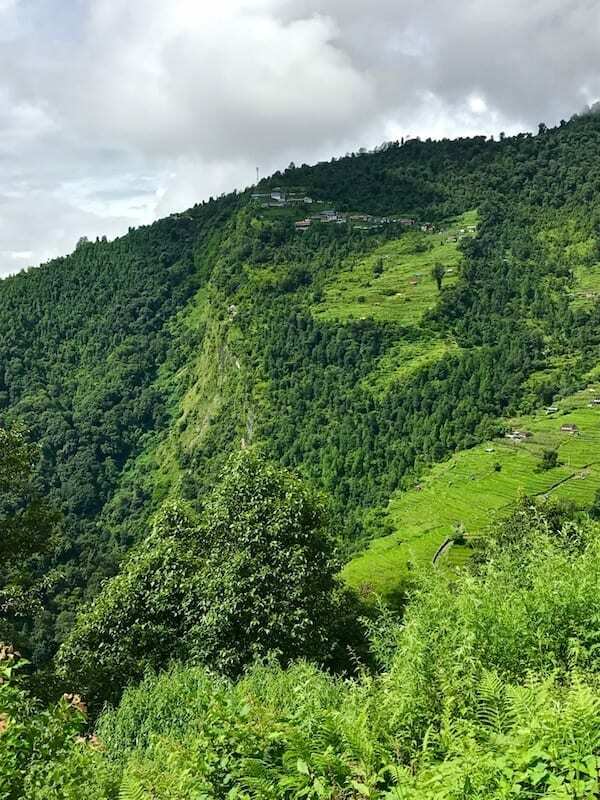 We would leave the normally inhabited areas of the highlands that day, and enter the Annapurna Sanctuary zone. Gradually, the mists lightened somewhat, shifted apart and back again as if the mountains were undecided about throwing off its blankets to greet the day. But I dragged myself out and down to breakfast, knowing I had another solid day of trekking ahead. 4.2 Did I mention that I pass for Nepali? 4.3 There are other Malaysians in these mountains?!?! One of the biggest downsides of insufficient preparation, is that you would be forced to expend all your willpower simply to keep going. And this limits the spare you have left over, to reach slightly further out and learn. What does this sigil mean? So it was that by Day 5, I still managed to notice some curious things, but either forgot or were simply too tired to follow up with someone about them. Even if ordinarily it would be so easily done. Like this sigil, for example, that I often saw affixed on doors of the guesthouse rooms. 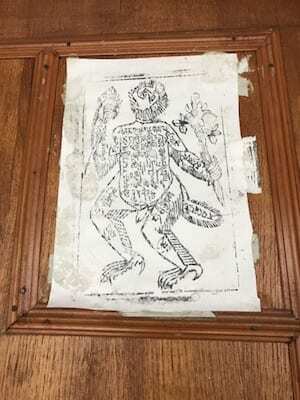 It was on the door of every room in the Chomrong inn. I had fleetingly wanted to ask what they meant. And the morning ritual that some innkeepers practice, which seemed to involve incense burning and prayers. I missed the chance to learn about that. 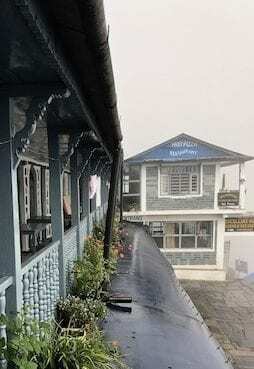 At the edge of Annapurna Sanctuary lies Chomrong, a large Gurung village that begins at the top of a hill and meanders in a sprawl of guesthouses, shops, and cafes all the way down the valley. Wait, did you say cafes? Inside Annapurna? 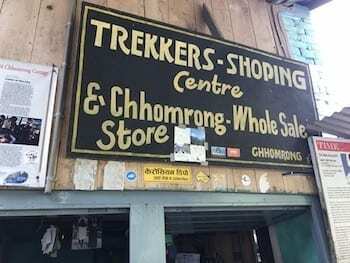 I reckon that Chomrong was probably already a market centre in the Annapurnas even without the trekking. The slopes of the valleys are well-farmed, and a significant part beyond it as well. Yes – the ubiquitous GERMAN bakeries! 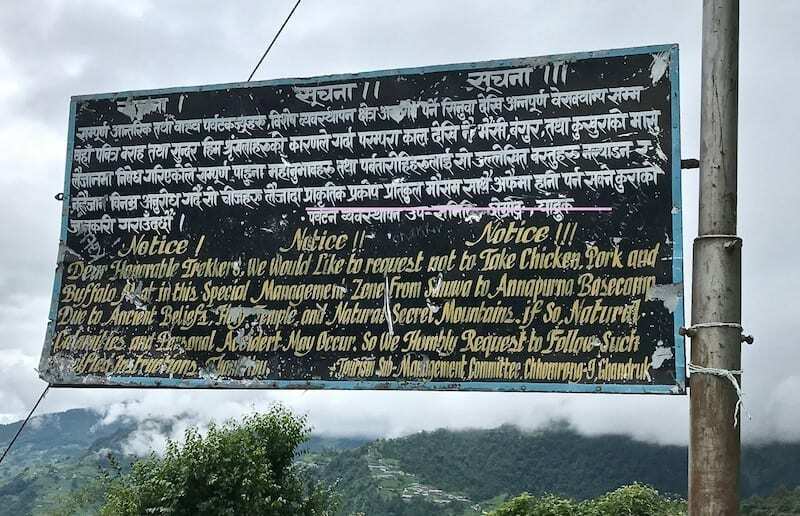 But since it was the last regularly inhabited settlement before the sanctuary precincts begin, naturally it became a congregation point for trekkers heading to the base camp as well. 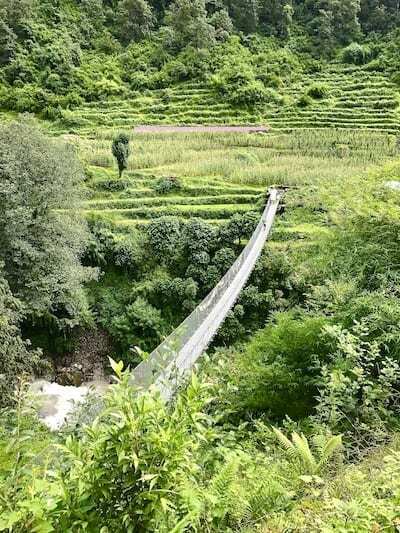 All the trekking routes would pass through here, because the way into Annapurna sanctuary was across a river gorge, via a long, slender cable bridge. So – I think even more so than in Ghorepani – there are businesses here that cater for the foreign trekkers. My inn even offers hot pizza, although not in the off season. 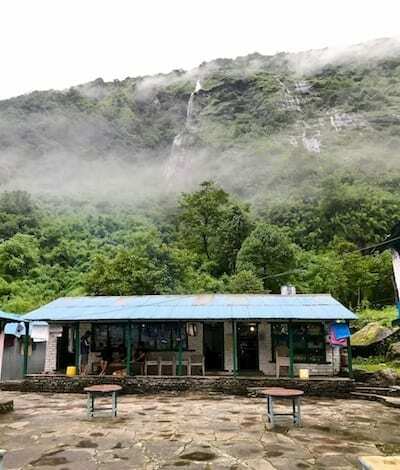 That’s the caveat of trekking the Annapurnas in the monsoon – the more ‘foreign’ offerings are more likely to be available only during peak periods. And… get this: of all the bizarre things… you can also get chocolate cake in Chomrong! And it’s supposed to be really good! I think maybe trekking companies should offer trekking packages that pause a little bit in Chomrong. Although I’m not even a dessert sort of girl, as a Malaysian I felt as if I let my nation down by finding out about the unexpected food options in Annapurna and yet not sampling any of them! We made our way down through the village after breakfast. I want to say briskly, except that the cold and my tired muscles would not allow that. But this was the day when I would finally see if I could get some Tiger Balm. And of course, the shop that sells it had to be all the way at the bottom of the hill. To be honest, by this time I had fallen into a state of indifference over the matter. Certainly the remainder of the trek – an ascent of nearly 2000 metres over the next three days – would be much easier if my muscles had some help tonight. But the exhaustion and the damp had become normal, even though it has only been a few days. Indeed, just over a week ago, I had found it hard to will myself to embark on this journey. And now, Malaysia and my desk job and my urban routines that were so hard to leave already seem like distant memories of a different life. But we finally arrived, at the shop that they call the ‘shopping centre’. The most successful brands in the world? The shop was not so very big, but it did seem to have the best range of any of the shops I’d seen on the trekking route so far. It seemed to cater both for the local farmers, as well as for the passing trekker. I looked over the choices for confectionery and drinks, chocolate and cookies, things as far apart as instant noodles and toilet paper. These were the things demanded by the outsiders, when they are far from home in the remote highlands of Nepal. 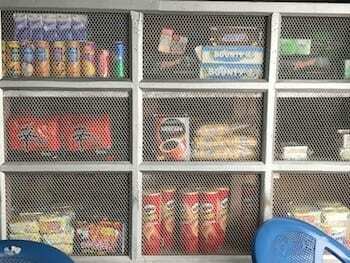 In fact, a few of those items – and I’m talking certain chocolate bars and potato chips – were so much in demand, they are frequently offered right in the food menus of restaurants and guesthouses. I reckon you could say, they won the brands competition! The shop’s OTC medication section did have Tiger Balm. My epic quest is over. No, I don’t mean the ABC trek. 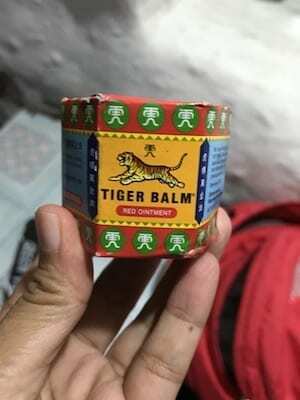 It seems that all Asians everywhere are united in our belief in Tiger Balm as the sacred remedy for all manner of sores and ills. In fact, if the Illuminati were Asian, the initiation ritual might very well involve Tiger Balm. And so my epic quest in search of muscle relaxant cream that began three days ago was concluded. I had found my holy grail. I picked out the larger jar, and bought one. The precincts of the plateau forming the Annapurna sanctuary area is sacred territory for the Gurung people. In fact, from almost the first day I checked into Pokhara, it was apparent that Machapuchare (the ‘Fishtail’ mountain) was particularly special to the local Nepali people. Its peak is always pointed out and admired. At first I thought it was merely because it had the most distinctive profile, and hence the most recognisable peak. But later I found that Machapuchare is a sacred mountain, and associated with the Hindu deity Shiva. Thus the area within the sanctuary is not normally inhabited. What is meant by this, is that there are no villages per se, like those along the trekking route thus far. There were still guesthouses, but these exist only for the trekkers that come visiting. I was told if I needed anything – whether amenities or supplies, snacks or treats – I should buy them here in Chomrong. Because beyond, it would be much more expensive. My guide explained that all goods are brought into the sanctuary and back down again, entirely on the backs of people. No donkeys or mules, no ponies or horses cross into the sanctuary bearing loads. It was one of the rules of the sanctuary, that beasts of burden are not used within the sacred ground. Everything? But, how do they kit out the guesthouses?? I thought of the beds and the blankets, the tables and the chairs, the gas canisters for the hot showers and the kitchen. “Nepali men are strong!” said Devi proudly. And indeed, as we left Chomrong to start the trek, I saw two Nepali men trot past us towards the long cable bridge, bearing loads on their backs. I felt that I was cheating by having Seema help me with my load, going into the sanctuary. 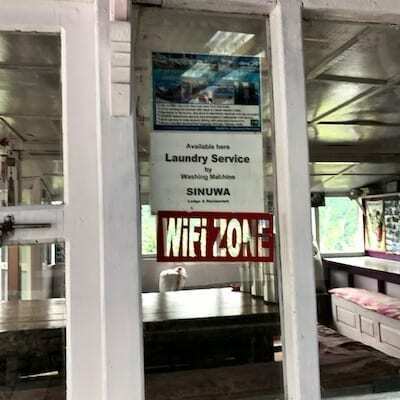 Near to Sinwa, I came across a sign explaining another taboo of Annapurna Sanctuary. It is a vegetarian zone. Although, I wondered why the sign only said ‘chicken, pork, and buffalo’. Did that mean other meats were allowed? Or is it just because those were the sorts of meats that people commonly eat locally, and it simply didn’t occur to them to prohibit any other kind? And what about fish? Devi did not think beef was exempted (probably obvious). In any case, it seemed that the intention was to be vegetarian. Fortunately, I was staying vegetarian on the entire trek anyway, which is the easy way of keeping halal. Although in the coming days, I saw that not all the trekkers respected this taboo. 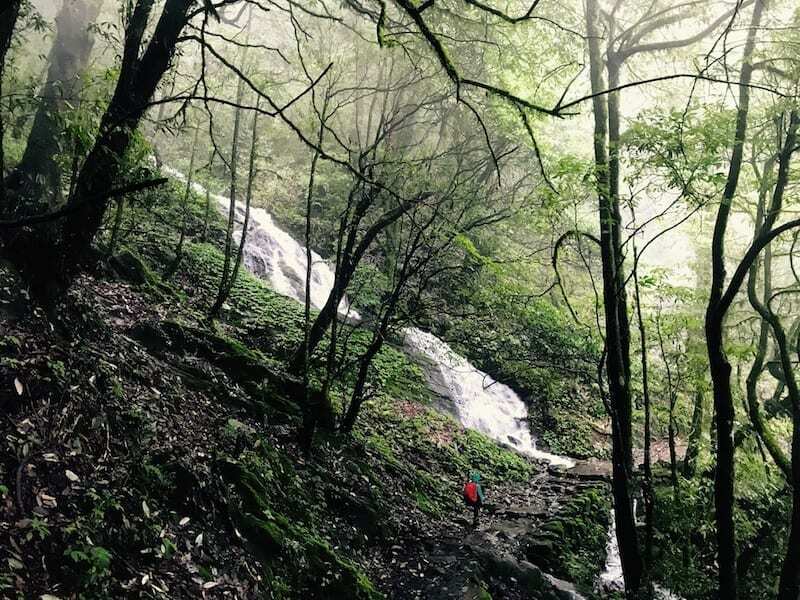 I was on this trek to Shiva’s sacred grounds (although I didn’t know it when I began), at the same time as many of my co-religionists were preparing to make pilgrimage to our sacred grounds of Mecca. It was the holy pilgrimage that would end in the ‘Bigger Eid’, the one when the faithful would donate a livestock animal for slaughter. Indeed, that is perhaps what sticks to mind for outsiders. The context is often missing, that traditionally livestock are foods for special occasions and form repositories of wealth for many rural or traditional societies. Thus, aside from its scriptural significance, its offering for general public festivities has also the meaning of the rich taking the greater share of supporting the community. Especially on festive occasions, so that the poor could celebrate too. 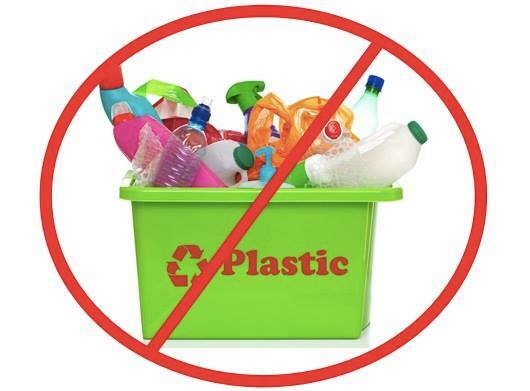 Nor is it perhaps widely known, that in the sacred precincts of Mecca, no living thing may be harmed. Throughout the rites of haj, pilgrims may kill nothing, nor harm any living thing – not a branch of a tree nor an insect – save only for defence. 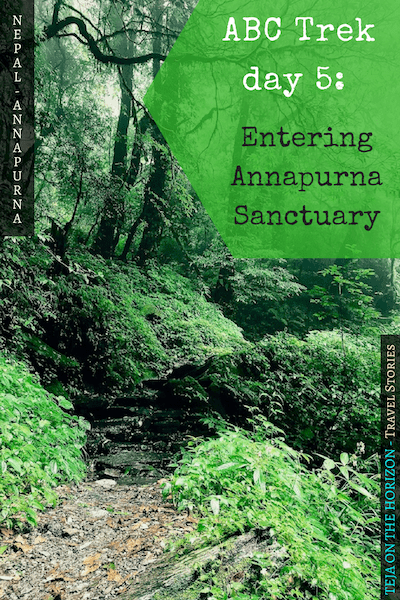 So I understood the taboo of Annapurna Sanctuary. It was not that there is a double standard between one location and everywhere else. Different from modern Western vegetarianism, it is not a philosophy that comes from man’s own opinions about what is theoretically appropriate for all mankind. As I’ve observed in my travels before in Oman and the Maldives, there are places in the world where it simply isn’t feasible to be vegetarian, nor does it make sense in the context of natural life on earth. Rather, the taboo was a matter of respecting the permission to kill for food. That it is not an inherent right of man, but a grace from the divine. Hence it invariably comes with values of temperance and frowns on excess (sadly, not always lived up to in many cultures in these prosperous times). And in the grounds where the divine has withheld the permission, it is a test for the submission of the faithful to His authority. All religions have more in common than is apparent. But only those who understand can see it. We began climbing once more, soon after crossing the cable bridge. Although my legs were no better than they were that morning, the fact that I had Tiger Balm in my baggage somehow unlocked willpower reserves, and I trudged upward with greater spirit. Was I really just there? That, and maybe also the fact that the sun had decided to shine upon us, warming us with his rays. At one point I looked back across the gorge. Perched small and high atop a shelf that ended in a precipitous drop, were tiny buildings. Was I really there just this morning? All the way atop there? If that morning’s trek looked as impressive as that, I wonder how I would feel to see from afar what I had achieved getting to Ghorepani. The warming sun was welcome not just to us trekkers. 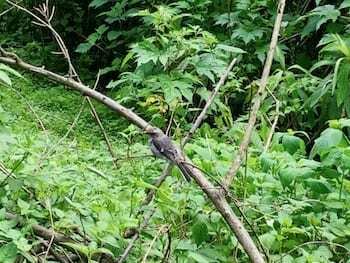 Butterflies chased each other along the trail, and birds began singing around the hills. Devi whistled back at them, causing some of them to call – perhaps confusedly – back. Colourful beetles roused themselves to movement, creeping over leaves in their bright exoskeletons. It made for a pleasant morning hike. I found many reasons to pause that morning. There were so many tiny things to appreciate in the mountains in the summer. 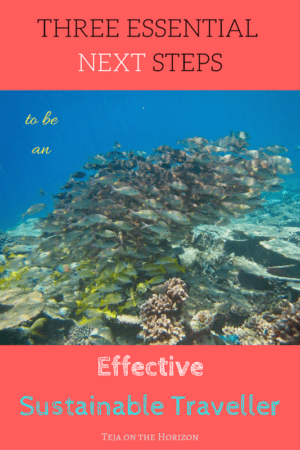 The more so if you slow down, stoop low, and learn to look upwards! 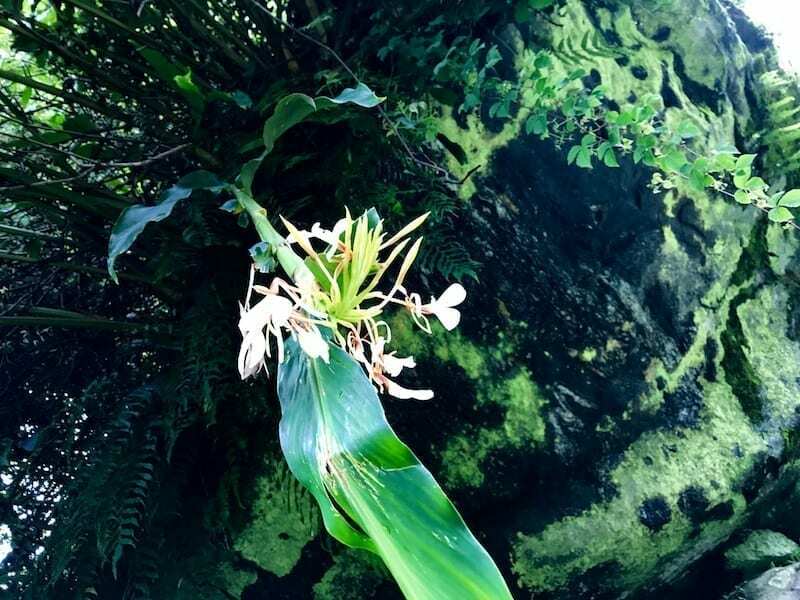 Look up to the toppled gingerflower hanging down! By this time, my guide and porter had gotten used to my diversions to examine insects, spider webs and flowers. I was not their usual trekking client. In fact, I was not the trekker type at all. I was journeying to the mountain like everyone else on this trail, yes. But my eyes were not only on the mountain. Although I did not have the science to identify the alpine life I found, I still enjoyed finding them. And I particularly enjoyed discovering how lovely even the tiniest, plainest flowers look close up. 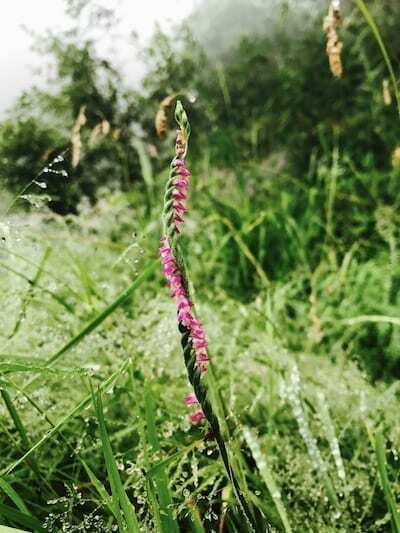 My guide pointed out the orchids, but she told me they bloomed only in March-April. Before long, I was sharing my clip-on micro lens with Devi, who proved to be much more competent with it than me. There were many ladybirds photographed in the Sanctuary for the remainder of our trek. She was also much better at creeping close to butterflies and birds to take photos of them. Even Seema began to relax and enjoy the flowers of summer, stooping and clucking over them every so often. It was her first expedition outside of the peak season. She herself was seeing the mountain and her summer blooms with new eyes. I felt glad to be that different kind of trekker for them. We stopped at Sinwa for lunch. It was just as well, since it began to rain. As we rested, other travellers came and sheltered as well. I was content to sit sipping my after-lunch tea, listening quietly. A Singaporean trekking with Caucasian companions, asking their reassurance that his trekking speed was ‘correct’. A group of Nepali guides and porters arriving ahead of their party, laying down their loads. Speaking to a client in… Italian? One thing I discovered quickly once I arrived in Nepal, was that many Nepalis are multi-lingual. 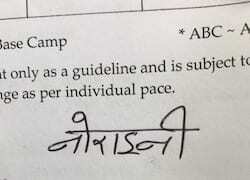 Aside from Nepali they would invariably also speak Hindi. But on top of that, it was not unusual – at least in Pokhara – for them to also speak other languages. My guesthouse host in Pokhara, and his driver, who both appeared so humble and provincial, surprised me by conversing fluently and comfortably in Japanese with their Japanese guests. They learned it on their own – in the driver’s case, he had worked in Japan for a time. 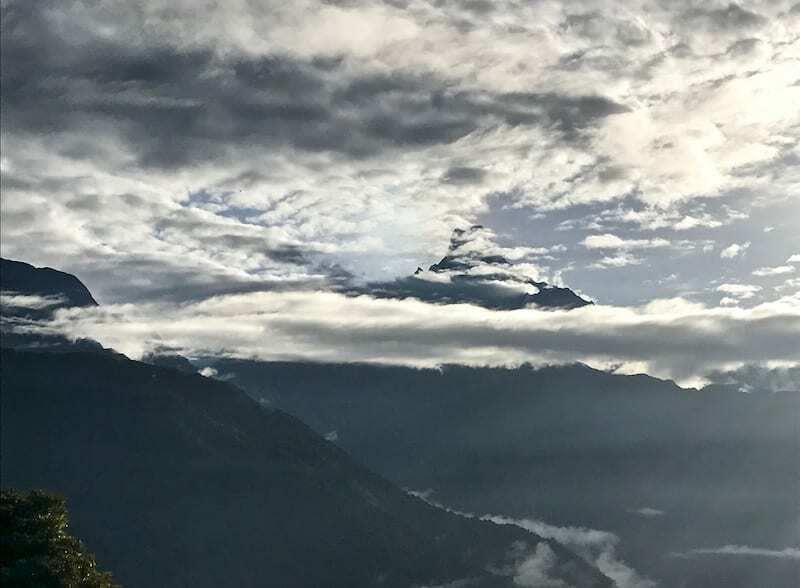 And the trekking guides throughout Annapurna – I have heard them speak English, Hindi, Japanese, Korean, Italian, and attempting to learn Mandarin from clients. You might say, but they work in tourism, of course they need to pick up the languages! 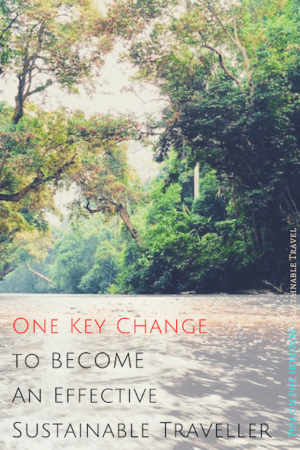 OK, now look into your own countries as I did for mine, and think about whether tourism providers in any of ours could match the repertoire of the Nepali trekking guides. No? Did I mention that I pass for Nepali? Some of the guides struck up a conversation with mine. They seemed curious. There was a Nepali guide in particular, leanly-fit and with an intelligent face, who kept turning back to stare at me, but much too professional to leave his client to satisfy his curiosity. He was kind of cute, actually. 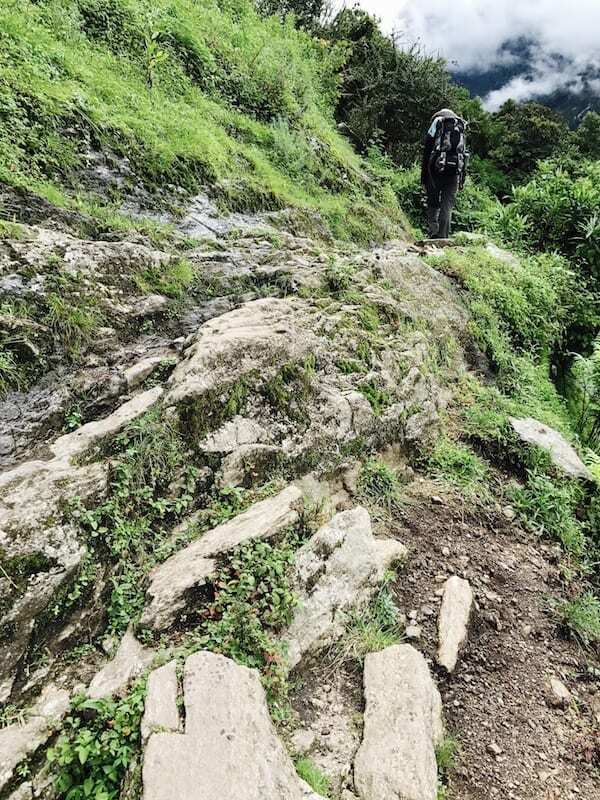 We have attracted the curiosity before – a woman trekking alone with a female Nepali guide and a female Nepali porter. Not only that, the woman looked Nepali herself? What is this phenomenon? Yes, I knew this on arrival in Nepal, ever since the immigration officer waved me over into the Nepali line, thinking I was mistakenly standing in the ‘foreigner’ line. But no, it was not a Nepali client after all. Just a Malaysian woman. Which I guess, is still a novelty! I asked Devi, whether ordinary Nepalis come to Annapurna to trek like the foreigners do. From Kathmandu, for example. Not really, she said. Although there have been some lately. I thought that sounded encouraging. There are other Malaysians in these mountains?!?! In the background, some newly arrived guides were speaking. The language sounded familiar. Very familiar. What on earth- ? And soon the rest of the train arrived, a group of Malay men jovially joking with each other in that very typical way they do, which was so familiar to me. Unsurprisingly they did not travel light. 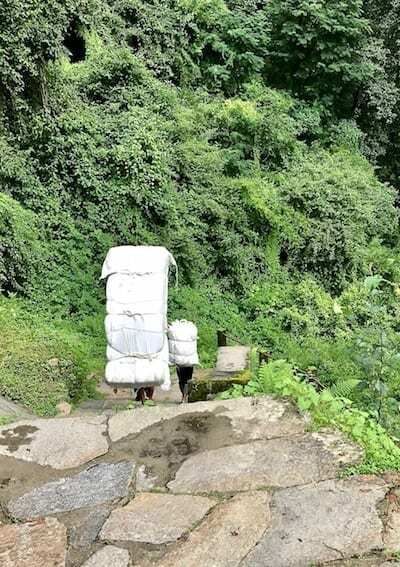 Besides what their porters carried, they themselves carried full loads. 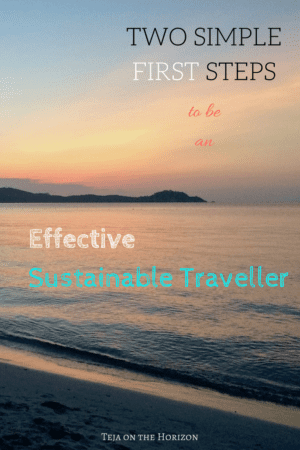 Malaysians travelling to type, travel in groups, and travel with food. I knew what they would have, even if they did not open their bags. Very likely canned sardines, probably eggs, instant noodles, and possibly also serunding (spiced meat floss). Hopefully fish, since they were after all in the sanctuary. I remained quiet as they had their lunch. I don’t remember how it happened, but they finally worked out that of the three women in the restaurant with them, one was their own. And what happened next was one of the most hilarious things ever. The guys were excited. Fancy that, a Malaysian woman – a Malay one too! all by herself – all the way up here in the mountain! With her own guide and porter! Who was she? What was her name? Is she really here on her own? How long has she been in the mountain? Where is she going? Where has she been? Her guide and porter are both women? Have them come over too! We were surrounded by a group of men seated around the table, watching us with fascination. It emerged that they did climbs like this together every so often. Whenever it is that their respective significant others would let them. There were indeed benefits to going solo, some of them owned, when I told them about my trekking situation. Sometimes it’s really hard to get other people to confirm. It was. And even more so if you’re female. Have you climbed Kinabalu then? One of them asked me, referring to our tallest mountain. Er, no. Actually, I’m not even a mountain sort of girl. Really more like a coastal sort. He paused and looked at me intently. Wow. And your first mountain, you decided to go straight to climbing the Himalayas? I actually hadn’t thought of that. But he was right. I guess it was kind of climbing. And OMG I did pick the tallest mountain range in the world! What was I thinking?! Maybe we could hire women guides next time, somebody mused. What about porters? Surely not porters, said his friend. Why not? Look, here’s one right here! “Tak gentle la… Takkan nak bagi orang pompuan bawak…*,” the friend replied. Who brought up the washing machine?? Well of course not everything! I’d carry much of it! was the defensive reply. I wasn’t sure how much of it was understood by Devi and Seema. But we all laughed at their antics. They moved on first, intending to make good time. They were making the ascent and back down again in much less time than we would. It was a cheaper overall trip that way, they said. When the three of us moved on as well, I noticed an interesting sign on one of the restaurants. It was proudly advertising laundry services – with a washing machine. This far into the sanctuary – which hero or heroes carried that washing machine on their backs? The way from Sinwa to Bamboo felt different from the trails we passed through in the earlier days. We walked through forests where the trees rose tall overhead, and past high slopes. The rains began again, and the mists returned to permeate the wood. Soon we began to see the bamboo forests that our evening destination was named after. And – unsurprisingly – the steep flagstone steps, always. It was not very far into the sanctuary, but the grandness of the space already quite easily made me feel small and insignificant. There was always water – from above, in vapour, and in many streams that fell from the tops of the mountains down every slope, and there were indeed many bridges in the Annapurnas. But although there were mostly stone steps through the forests and up the cliffs, and bridges across the streams, there were points where I would not have been sure where to go. A few times, were it not for Devi picking her way up a side of stone, or down an earthen track, I’m not sure where I would have gone. It was not easy, hiking up the punishing steps with inflamed muscles. But at long last we arrived at the guesthouse in Bamboo. In part because of the distractions of the morning, it had been a much longer trekking day than usual. So it was close to sunset by the time we settled in to our rooms. The guesthouse was set in a clearing right along the trail itself, with detached buildings for the rooms, the bathrooms, and the dining hall. I was cold. There was electricity, but there were no double-glazed windows here, and no furnace. The resident cat curled up on the cushioned bench at the dining table, oblivious to the world. He was cold too. In fact, he was so well past caring that he didn’t twitch when I mischievously laid a deck of cards upon him. 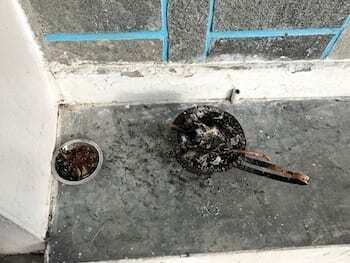 When the hot shower was ready, it was a gas fired one – for damn sure. And it was extremely difficult to leave the bathroom, for it meant leaving the warmth and the steam, and the delicious heat. Over dinner I reflected on this. I did not belong in the mountain, a creature of the hot equator. The mountain folk take this chill in stride. But despite my fleece and thermals, I still craved the heat of the shower to take the chill out of me. 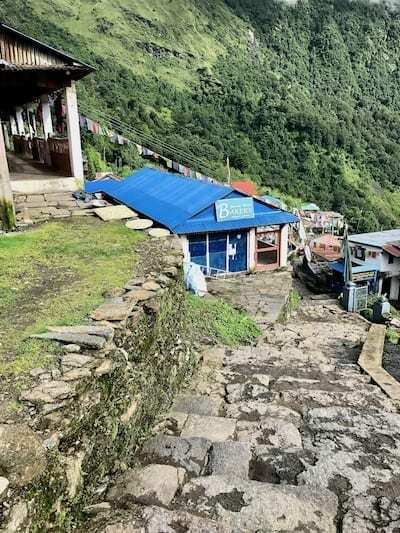 It was a luxury only possible in the sanctuary, because of the energy-dense gas fuel, which the Nepalis had to carry far up the mountain, on the same trail that I managed with much labour and difficulty. And it wasn’t even priced beyond my reach. I was roomed in the upper floor of the two-storey guest building. Like many of the guesthouses in Annapurna, there was a resident dog. Unlike most of the rest, which were a kind of black and white mix, this one was brown. And it liked to lie on the stairs, which made me wary until I was satisfied that it was tame, and had the manners to keep a polite space bubble. There was a small group of young Italian guys there in Bamboo that night with us. They took the room next to mine, closer to the stairs. I half wondered if I ought to make friends, but as with most people who already have travel companions, they were absorbed in each other. The dog, though, didn’t quite approve of them. It growled at them mistrustfully, although did let them pass to their room. It did, however, decide to take upon itself the responsibility of my security. The brown dog moved from its spot and settled right in front of my door. None could pass the corridor to my door without crossing it. I couldn’t help but smile at that. Tired as I was, it was unnecessary but comforting nonetheless. I settled in for the night after a good rubdown with the Tiger Balm, took both thick blankets in the double room, and cocooned myself in my thermal liner under them. And only then was I warm. When I woke the next morning, the loyal little brown dog was still there. The crossing bridge has a great view! Haven’t heard about this but its amazingly great! Love this sanctuary already. Thanks for sharing this! Nice writings!